Written by Catherine Saxelby on Wednesday, 29 April 2015. The diet book Can't Lose Weight? You could have Syndrome X by Australian doctor and naturopath Sandra Cabot is another variation of the low-carbohydrate, high-protein diet made famous by Dr Atkins in the 1970s and again more recently. It tantalizes the reader with the longish title Can't Lose Weight? You could have Syndrome X. Like the common excuse of an ‘underactive thyroid' for overweight, here is the newest one - "I can't lose weight, I have Syndrome X". Cabot has divided the book's 348 pages into 24 chapters, starting with a run down on the Metabolic syndrome followed by chapters covering diabetes, types of diets, insulin, ketosis, carbohydrates, Glycaemic Index, sweeteners, fats, labels, obstacles to weight loss and protein. She also includes plenty of practical tips on food selection. Next is over 70 pages of attractive recipes contributed by ‘recipe tester' Audrey Tea you will also find ideas for breakfast, salads, lunches, mains and sweets. This recipe section also includes ‘Syndrome X energy cookies' and ‘Syndrome X energy slices' which although not especially low in carbohydrate appear to be nice wholemeal products baked with nuts and dried fruit. Unfortunately we aren't given any information on their nutritional composition - some are asterisked as being lower in carbohydrate. We also get to learn a lot about Cabot's earlier best sellers as they are all worked into this book via sections on how to work out your body type (The Body Shaping Diet), hormonal imbalances (Don't let Hormones Ruin your Life) and why ‘incorrect diet is the major cause of fatty liver' (The Liver Cleansing Diet). The Syndrome X Diet is described as a ‘12-week metabolic weight loss eating plan' that progresses the dieter through three stages, with the last being a used for weight maintenance. The First Stage is 6 weeks of very low carbohydrate eating where no bread, pasta, rice, lollies, desserts or starchy vegetables are allowed. The only carbohydrates permitted are those from legumes ‘in moderation' (no quantities given) and two serves of fruit a day (but not the ‘high sugar' types such as banana, mango, pears, pineapple and papaya). Milk is to be avoided. There is are no guides on exact quantities of carbohydrate to be consumed during this stage nor is there a meal plan to help you, which is frustrating. For those who want a more rapid weight loss or who are ‘metabolically resistant' they are advised to consume only 18 to 30 grams daily with the cautionary note ‘under the supervision of a health care professional'. Stage Two comprises a further six weeks of low carbohydrate eating where the dieter is now allowed to include a limited amount of carbohydrate in the way of bread, starchy vegetables and selected fruits. Again no specific quantity of carbohydrate is given. The final stage, Stage Three, is a maintenance eating plan to follow once your desired weight is achieved. Cabot outlines this Stage as providing 40 to 45% of calories from carbohydrate. For the average reader it is hard to interpret what this means in terms of serving sizes and amounts of carbohydrate foods each day. Like her other books, there are ‘food gimmicks'. One of these is the promotion of stevia as a ‘safe non-caloric herbal sweetener' in place of sugar. Her ‘Syndrome X Snack Pack' (p 223) is another ‘gimmick' and consists of nuts and dried fruit which you can order pre-packed directly from her. A long list of supplements is also suggested such as milk thistle, taurine, psyllium and dandelion for liver or chromium picolinate for slimming or gymnema sylvestre, bitter melon and lipoic acid for modifying insulin. One feature of the book for readers to beware of is the fundamental error Cabot makes in her simplistic classification of carbohydrates and their relationship to Glycaemic Index (GI). Simple and complex as a means of dividing carbohydrate types is a notion long discarded by nutritionists and Cabot's statement "Complex carbohydrates do not cause a rapid rise in blood sugars.." (p 104) cannot be true when according to her tables (p 123-130) rice, potato and water crackers - all examples of ‘complex carbohydrates - are high GI and hence rapidly absorbed. Sugar is also supposed to ‘cause a rapid rise in blood sugar and insulin'. however the accepted GI for table sugar (sucrose) only moderate (average 65), placing it in a similar category to basmarti rice, honey, some fruits and some breads. Were it listed in the tables of carbohydrate foods (p128) at least readers would then be able to draw their own conclusions. Trans and hydrogenated fats also cop a hiding. Cabot has not caught up with the fact that almost all margarines are now free of trans fats in Australia and our fast food industry does not use hydrogenated oils (another high source) but prefers palm oil and beef tallow. Another worrisome thing is that Cabot does not recommend any dairy and declares ‘it is easy to get all the calcium you need without eating dairy products. '(p 221). A table of calcium values gives surprisingly high figures for non-dairy foods. However readers may find it difficult to replace three serves of dairy with two cups of wakame seaweed or 2 cups of canned salmon or 3 cups of brazil nuts a day to ensure their calcium requirements are met. Until you realise that the standard serve sizes have been inflated e.g. 1 cup (no weight given) of canned salmon is supposed to have 431 mg calcium and 1 cup wakame seaweed comes in at 520mg compared to 1 cup skim milk at 300 mg. Overall, the Syndrome X diet is nutritionally ‘better' than a straight Dr Atkin's high-fat high-protein diet because it is not high in saturates but rather promotes healthy fats like cold-pressed oils, avocados, nuts and seeds. The book appears scientific and has enough of the usual nutrition terms like BMI, GI, etc., to win over readers. But the incorrect GI information and the vagueness of the diet plan make it hard to recommend. However anyone cooking the recipes will still consume a healthy diet with plenty of vegetables and legumes. No exact quantity of carbohydrate is offered nor is there a meal plan to guide you, which is frustrating. Those who want more rapid weight loss or are ‘metabolically resistant' are counselled to drop their carbohydrate intake to only 18 to 30 grams daily with the cautionary note ‘under the supervision of a health care professional'. The final Stage Three is a maintenance eating plan once desired weight is achieved, set at 40 to 45% of calories from carbohydrate, but it would be hard for the reader to work out how much carbohydrate this means. The latest incarnation of this book is called Can't Lose Weight? 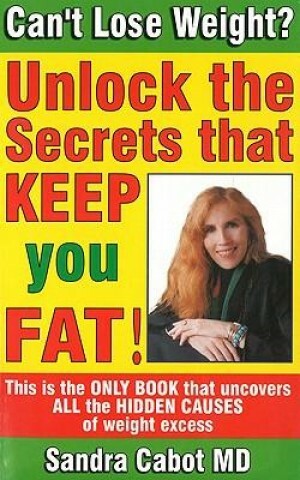 Unlock the secrets that make you store fat and is available from the Book Depository here (affiliate link) with free worldwide shipping.